On Tuesday night in Florida, Democratic senator Bill Nelson conceded a Senate race to Republican Rick Scott, because he was trailing the Florida governor by more than 57,000 voters. Tallahassee Mayor Andrew Gillum, meanwhile, conceded Florida’s governor race to Republican Ron DeSantis, because he was trailing the congressman by an even larger margin. And then, Nelson and Gillum discovered that there were more outstanding votes from heavily Democratic counties than they had realized. By Thursday afternoon, Nelson’s deficit had fallen to just 17,000, or 0.22 percent. State law requires a manual recount of any election with an initial margin under 0.25 percent. Gillum’s deficit, meanwhile, fell to 38,000, or 0.47 percent, which is under the 0.5 percent threshold that triggers an automatic machinerecount, under state law. More significantly (and alarmingly), irregularities began to emerge in Nelson’s pattern of support. Specifically, an aberrant percentage of voters in Broward County marked their ballots for gubernatorial candidates — but left the Senate ballot-line blank. Broward stands out for having 3.7% of its ballots left blank for #FLSEN but cast for #FLGOV. It’s possible that this was a product of bad ballot design (similar to the infamous “butterfly ballot” that led some Broward County voters to accidentally vote for Pat Buchanan instead of Al Gore in 2000). 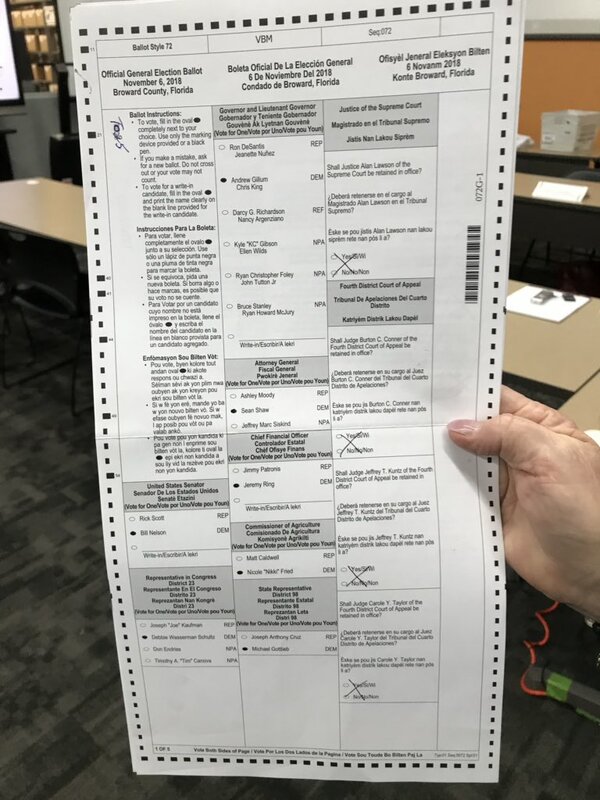 Specifically, many voters in Broward County reported having had difficulty finding the Senate race on the ballot, as it was tucked beneath a long block of voting instructions on the ballot’s left-hand column. This theory is buttressed by the fact that undervoting in the Senate race was especially pronounced in Florida’s 24th Congressional District, where no House race was listed (as the incumbent ran unopposed), and thus the Senate race box was even lower down on the ballot’s left-hand side. It was low in each precinct compared to rest of state, but especially low where no House race was on ballot. Poor design! To put some numbers on this: Broward County has a population of nearly 2 million. About 90,000 of them -- a little under 5% -- live in the FL-24 portion. Overall, there were at least 700,000 ballots cast in Broward, so probably around 30,000 of them are from the FL-24 portion. If ballot design produced the undercount, than nothing can be done to rectify the error. But it is also possible that vote-processing machines in Broward suffered a technical glitch that caused them not to read Senate votes that were properly marked on paper ballots — and if that is the case, then a recount would very likely tip the Senate race to Nelson. For this and other reasons, lawyers for Nelson and Gillum decided to call on the state of Florida to honor its statutory obligation to perform a recount. In response, Florida senator Marco Rubio decided to accuse the Democratic Party of conspiring with Broward County election officials to illicitly overturn the will of the electorate, and illegitimately install Bill Nelson into the U.S. Senate. The Broward County Elections Department has come under fire in recent years for a series of glitches, mistakes and errors that have many wondering if their votes will count this November. Rubio offered no evidence to support the claim that Democratic lawyers have been very clear that they don’t want every vote to count, and are merely seeking to win the election by any means necessary (even if that involves not counting all the votes), nor did he specify what “ongoing” violations of the law Broward County election officials were engaged in (notably, the “elections supervisor with a history of incompetence” was appointed by former Republican governor (and Rubio ally) Jeb Bush). The Florida senator also neglected to mention the fact that more than 20 percent of voting-age African-Americans in Florida were prohibited from casting ballots in Tuesday’s election – largely because Rick Scott made disenfranchising them a top policy priority. The fact that we're treating an election in which more than one in 5 African Americans were disenfranchised as anything but a grotesque farce is a massive indictment of the U.S. media and of so much of our entire political discourse. Under Crist, 155K people who completed a conviction regained voting rights over 4 years. Scott became governor & restricted rules further. Just 3K people regained voting rights! Over 8 years!! Scott DIRECTLY suppressed the vote of hundreds of thousands. Now he's up 17K. To be sure, it is perfectly reasonable for Republicans – or anyone else, for that matter – to demand an explanation for why it is taking Broward County so long to finish its initial vote count (as opposed to the impending recount that will likely follow its completion). But as of this writing, there is simply no reason to believe that the delay is the product of anything worse than incompetence. Even after Nelson conceded Tuesday night, the New York Times’s forecasting algorithm was only giving Rick Scott a 53 percent chance of winning the election – because, based on the vote totals in other parts of the state, the model assumed that there had to be a lot of missing votes in (heavily Democratic) Broward County. Which is to say: One doesn’t need to invoke a vast left-wing conspiracy to explain why Nelson gained votes between election night and Thursday afternoon. And yet, Rick Scott and Donald Trump have now joined Rubio in doing so. Many #NeverTrump conservatives like to fantasize about a world in which Marco Rubio won the 2016 GOP nomination — and, as a result, the Republican Party retained its commitment to civility over demagoguery, and democratic ideals over the raw pursuit of power. There are many problemswith this fantasy. But two conspicuous ones are that Rubio spent much of his 2016 campaign baselessly accusing America’s first black president of deliberately sabotaging the country (“he knows exactly what he’s doing”); and that he is now telling his supporters, without evidence, that if Bill Nelson wins a recount they should regard the outcome of the 2018 Florida Senate race as illegitimate. Which suggests that reckless demagoguery would still have a place in Republican politics – even in a universe where Donald Trump didn’t. Hopefully Nelson and Gillum can pull out these wins...would be fantastic! Democrats are the scum of the earth.